Sorn Restaurant (ศรณ์) - 22 Course Meal of Fine Southern Thai Food in Bangkok! Sorn (ศรณ์) is a restaurant in Bangkok that specializes in fine Southern Thai food. You’ll experience a journey through Southern Thailand on your plate, including 22 different dishes, each vibrant, colorful, and an excitement to your taste buds. In this article, I’m going to share with you everything I ate at Sorn (ศรณ์). 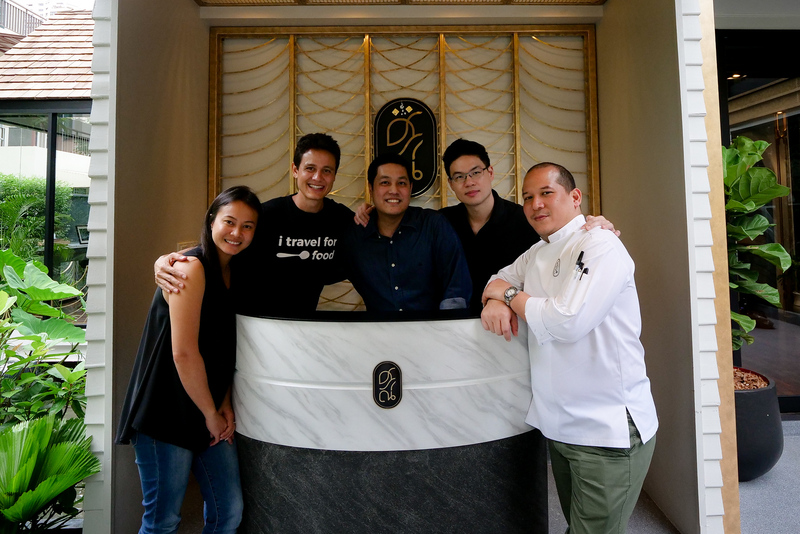 So I was very excited to try Sorn (ศรณ์), a fine southern Thai food restaurant, started by the owners of Baan Ice – Khun Ice and Khun Yodkwan. It was an exquisite meal, and even though I eat a lot of southern Thai food, this was a new and learning experience, packed full of vibrant flavors, combinations, and southern Thai food tradition. Not only are the ingredients all local, but as Khun Ice told me, 99.9% of the ingredients they use at Sorn (ศรณ์) are directly from Southern Thailand, straight from the source, sometimes from individual accountable farmers or fishers. Hanging out for lunch with Khun Pup, we began our 22 dish exquisite Southern Thai food lunch experience. First part of the meal was one-bite dishes. 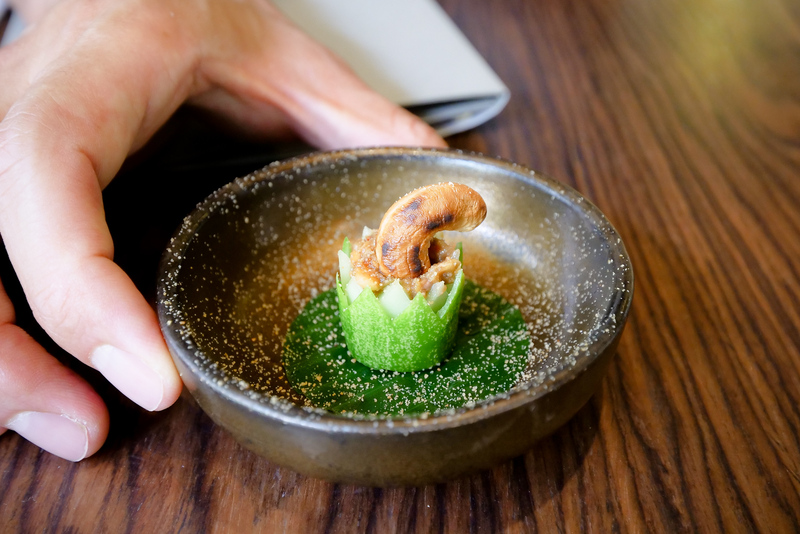 A cucumber mini-cup, filled with a unique southern Thai chili paste, and topped with a perfectly roasted cashew. It almost had a cashew butter kind of texture and taste, with a balance of shrimp paste umami. The cucumber provided an extra refreshing crunch. Have you tried sand mole crabs!? Next was deep fried sand mole crabs, something I didn’t even know existed before this meal. They were from Phuket, and only available in this particular season. The crabs were fried until completely crispy, with a few slices of fresh chilies and garlic. They were crunchy all the way through, delicious. 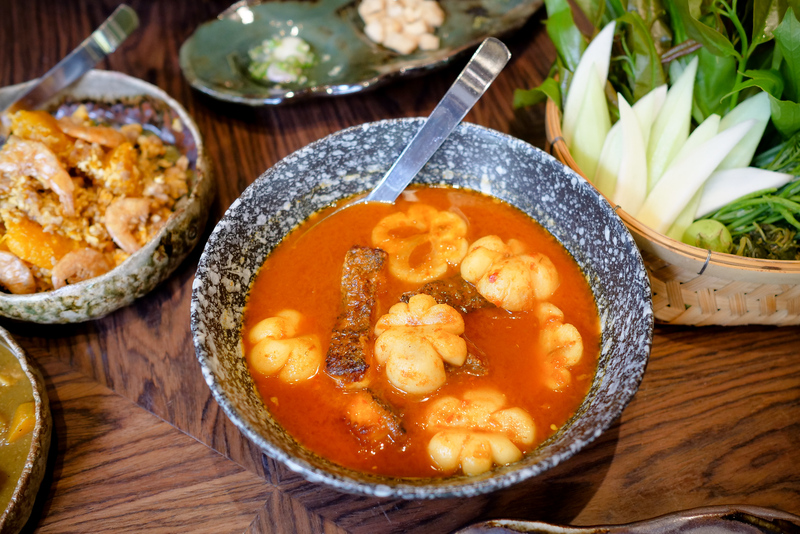 One of the highlights of eating at Sorn (ศรณ์) is that they’ve taken traditional Southern Thai recipes, and occasionally used science, or modern fine dining techniques, to optimize certain ingredients. Chef Yod and Khun Ice discovered that 7 colored lobster from Phuket is at optimal taste and texture when chilled to 2 degrees Celsius. So it was a bite of raw southern Thai lobster, topped with a dab of Thai seafood sauce – spicy and tangy. This was one of those bites that made me gasp in awe. 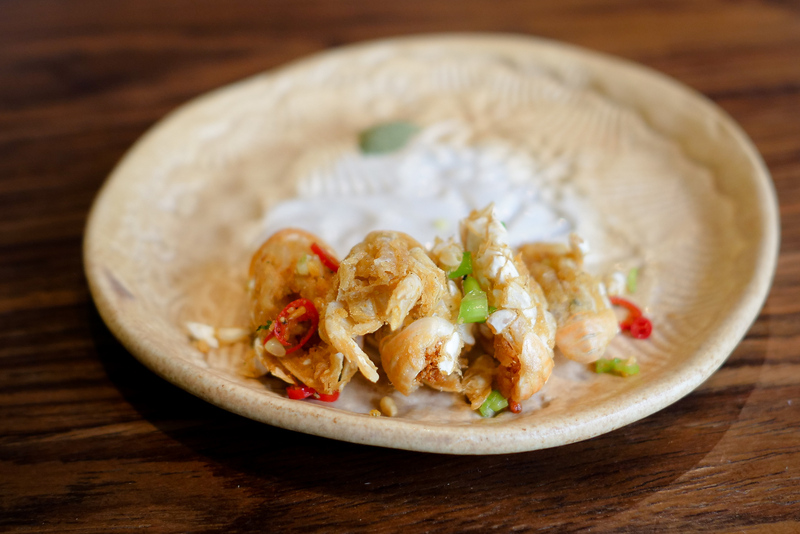 So naturally sweet and creamy, with the jolt of vibrant spicy and sour seafood sauce. 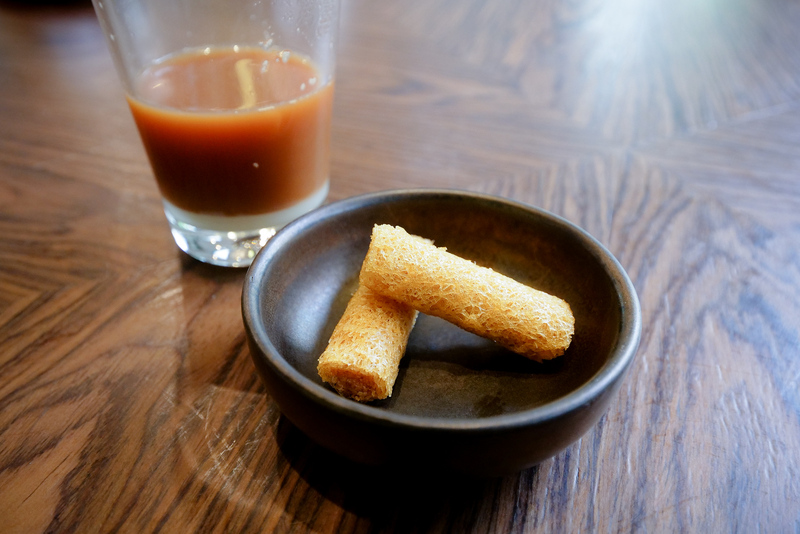 You have to eat this bite as fast as it’s served so the rice cracker remains crispy. The curry on top was a mixture of coconut cream, spices like turmeric, and the head tomalley of the lobster. It was one of the greatest single biters of the meal. Imagine the best single parts of the crab all combined into one unbelievable single bite, and that’s what this is. 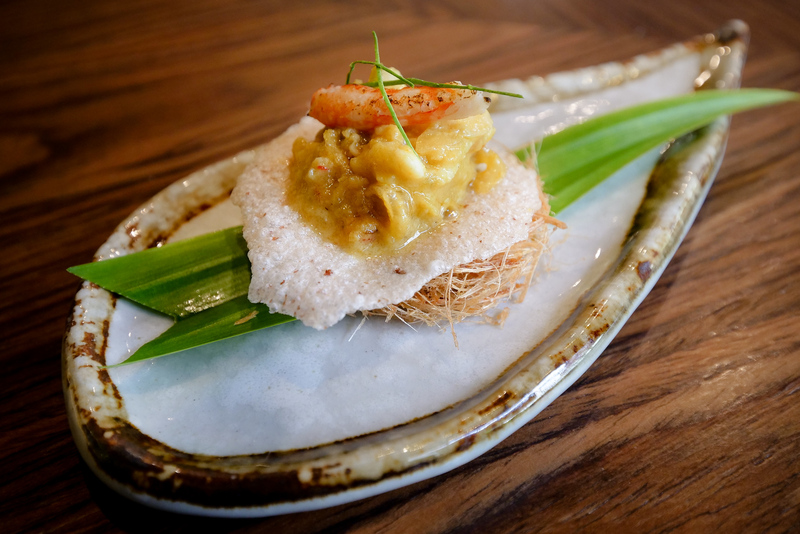 The crab nugget, still attached, was coated in a southern Thai yellow curry, then plastered with its own crab roe. The result was the sweet silky crab meat, the creamy curry, and the rich yolk-y roe, all in your mouth at the same time. Galae (กอและ) is a style of southern Thai grilled meat, usually it’s made with chicken (here’s my favorite one in Thailand), but the version at Sorn (ศรณ์) restaurant was made from Southern Thai beef. Instead of using palm sugar, all the sweetness came from dates. It was very fragrant, sweet, balanced with saltiness, and kind of fruity from the dates. One of the ultimate southern Thai dishes, something my wife and I always eat for breakfast especially, when we’re in the south of Thailand is khao yam (ข้าวยำ), a rice mixture, or salad. Typically it would be made with regular steamed rice, but at Sorn (ศรณ์) they came up with a brilliant idea to use toasted crispy rice, so it wouldn’t be too filling (considering you’ll have a lot more courses to eat throughout your meal). Just a few of the key herbs – torch ginger, toasted coconut, kaffir lime leaves, winged bean, lemongrass, and pomelo. 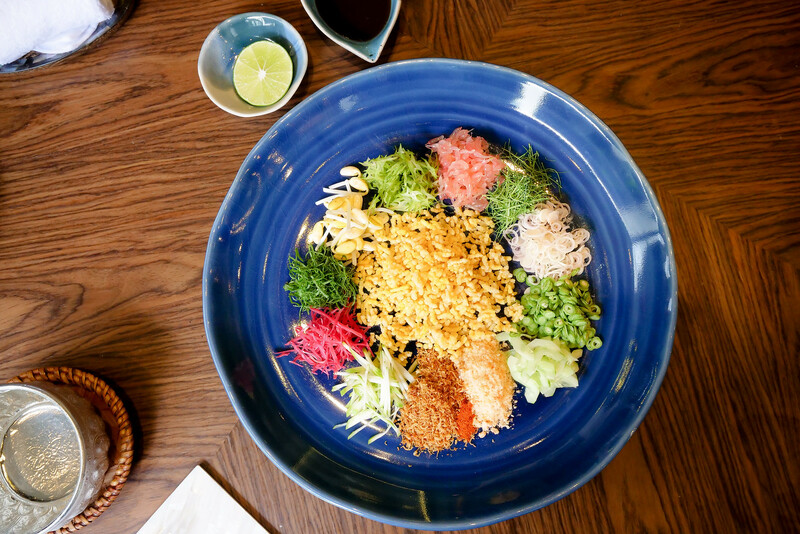 The salad is mixed with a fermented fish viscera sauce and a squeeze of lime. This was the most well balanced and fragrant version I’ve ever had. AMAZING. Something I immediately loved about eating at Sorn (ศรณ์) is that they really care about doing things the tradition, no-shortcut method. 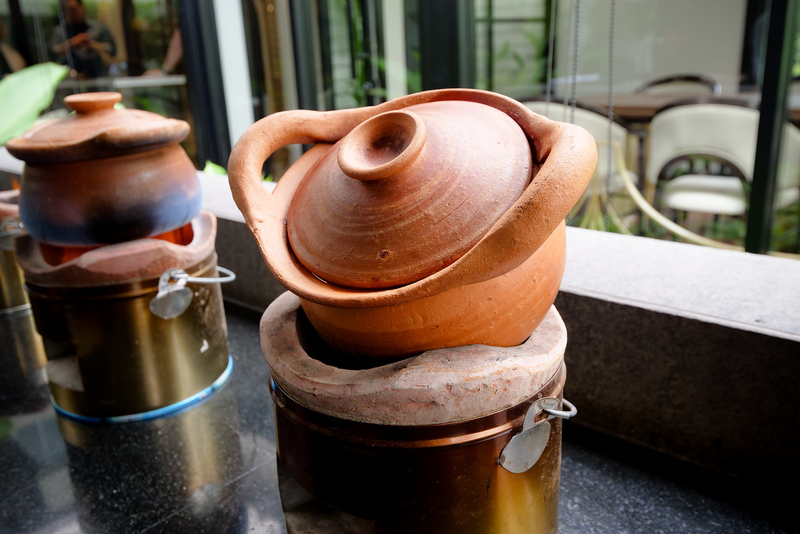 You won’t find rice cooked in a claypot like this very often in Thailand anymore. Someone has to continually monitor the claypot, turning the rice on its axis, while balancing the water the entire time it’s cooking. The result is a fragrant fluffy rice, cooked over charcoal. The rice grain that we ate was a seasonal crop from Nakhon Si Thammarat. A Thai nam prik is any variety of chili paste dip, and there are countless varieties, but this was different from any other version I’ve had. Spread into a coconut shell, and grilled over very low charcoal heat, this chili paste was extraordinary with hot rice. I could really taste the coconut, shrimp paste, and a citrusy component, I think from kaffir lime leaves. It was truly fantastic, especially with rice, and chasing with a variety of different herbs. Gaeng leung (แกงเหลือง), also called gaeng som (แกงส้ม) commonly in southern Thailand, is Thai sour curry or yellow curry. It’s one of my favorite single dishes in the world, and because my wife’s family is from Krabi in the south of Thailand, I eat it frequently. Here’s my mother in laws recipe. 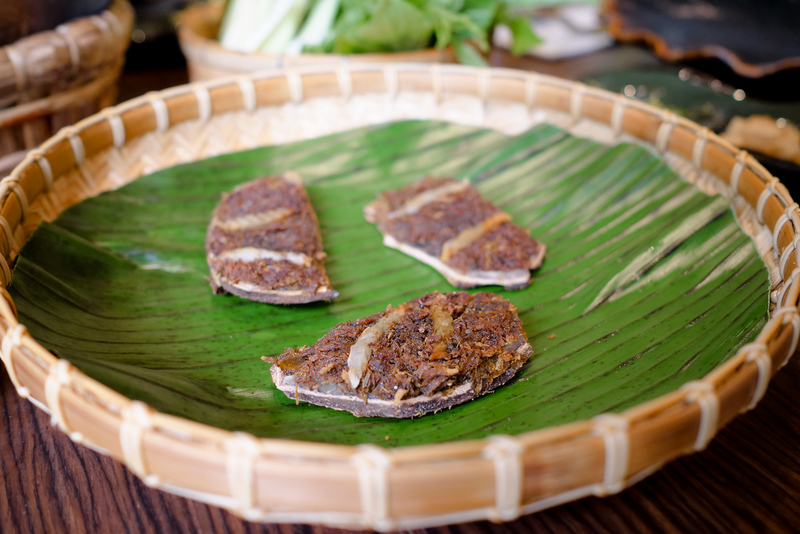 Normally it’s prepared with fish and vegetables that can include green papaya, taro stems, or bamboo shoots. But at Sorn (ศรณ์) restaurant, their version is cooked with young mangosteen, providing a unique sweetness to contrast the turmeric and chili filled curry. It was sensational. Another favorite southern Thai dish is gaeng tai pla (แกงไตปลา), a curry flavored with fermented fish innards. It sounds harsh, but a well balance version is unbelievably flavorful, and a punch to the mouth. In their recipes they included line-caught tuna, pumpkin, sweet potato, and jackfruit seeds, along with cashew nut paste to make it slightly creamy. It was amazing, a creeping chili heat, and ultimate combination of flavors. Gaeng leung (แกงเหลือง) is one of my favorite dishes, but stinky beans, are one of my single favorite ingredients in the world. Here they were stir fried with squid filled with eggs, and shrimp paste. Very good as well, a little on the sweeter side. I liked a detail in which they cut little slivers into the stink beans so more flavored could be absorbed. Next up was a clear soup, prepared with boiled pork bones, pork stomach, and steamed egg sausage. 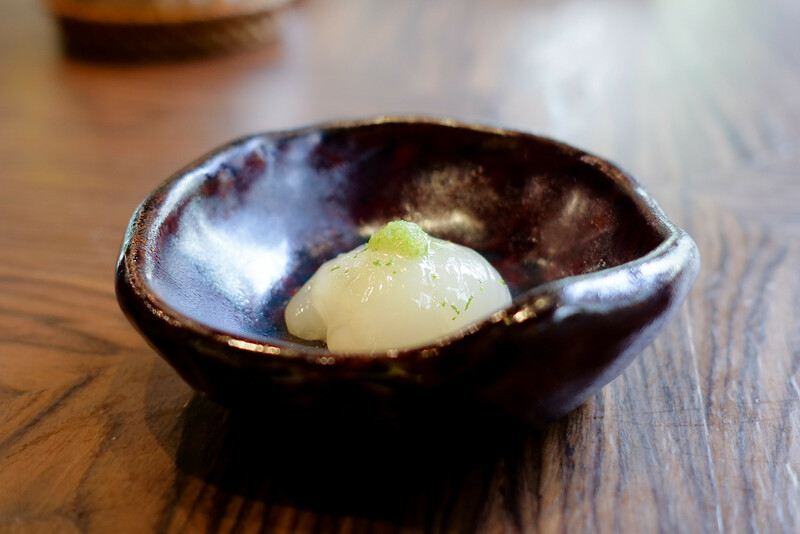 The egg just sort of dissolved into my mouth, so light and delicate, and cleanse to the mouth after so many incredibly flavorful dishes. 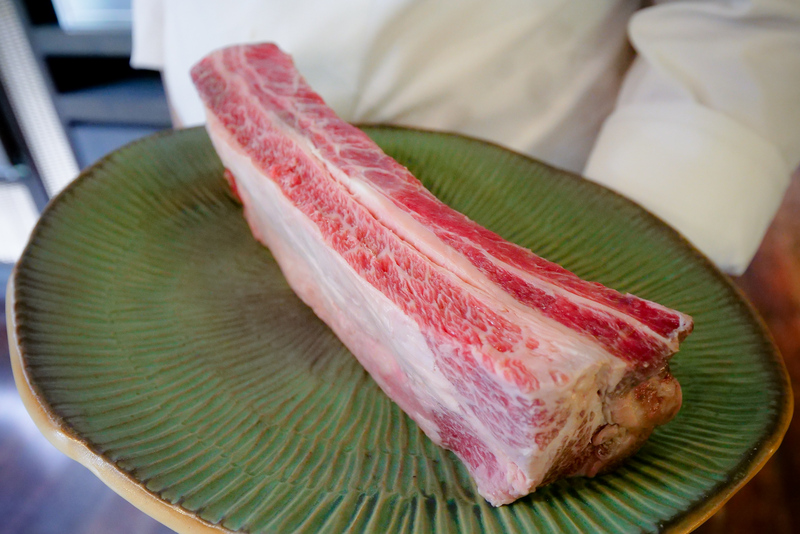 Another standout dish of the meal was the grilled crispy pork belly, perfectly crunchy and golden skin, with a wonderful ratio of fat to meat to crispiness. 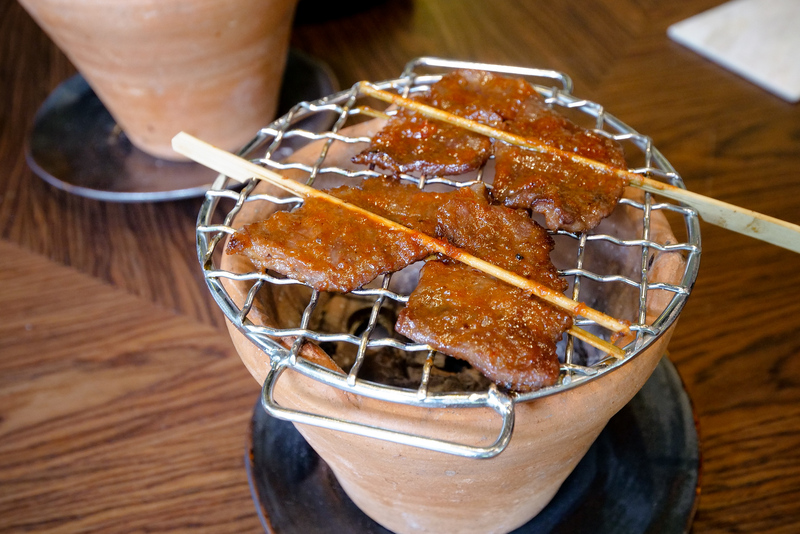 The unique part of their grilled pork was that it was served with a dipping sauce made from khua kling (usually a southern Thai dry curry) paste. 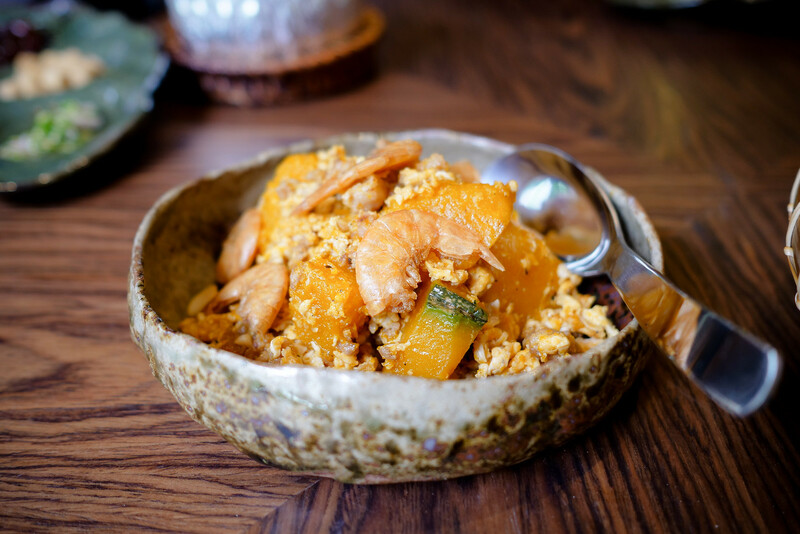 This was probably the most comforting dish of the meal, stir fried pumpkin with egg – and extra crispy shrimp for flavor. 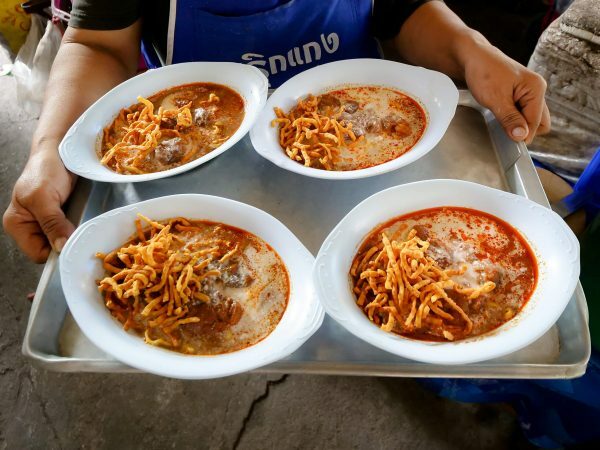 This is a classic, often served at Thai khao rad gaeng (rice and curry) stalls. The key here was good quality pumpkin, cooked so it was soft and silky yet not mushy, and coated in egg. After we finished the main sharing dishes, there was one more main savory dish, and it was another stunner. 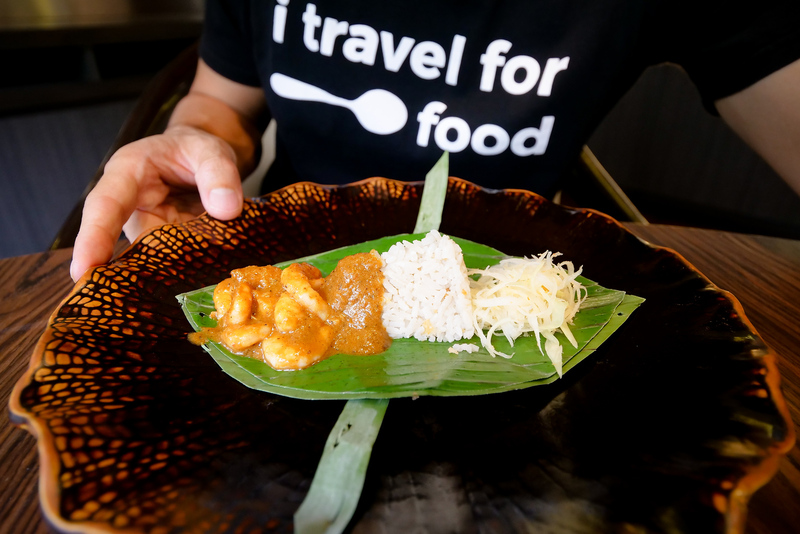 Called khao man gaeng (ข้าวมันแกง) in Thai, the rice came wrapped in a banana leaf packet, cooked with coconut milk and shrimp, served with shrimp curry, and green papaya. First bites reminded me of Malay nasi lemak, the rice was so fragrant, and in the curry you could taste more of a dry spice blend. Amazing, I loved it. 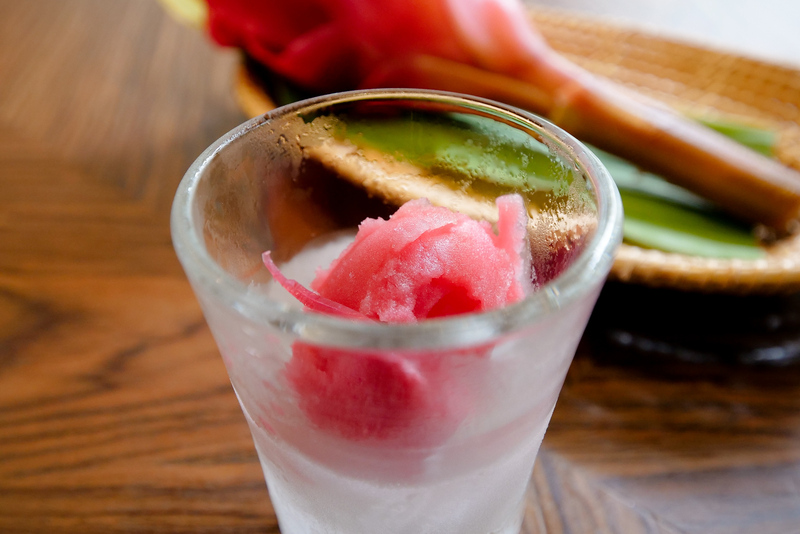 Made from torch ginger flower, an ingredient I always love, this sorbet was so good, I wanted an entire giant bowl of it. Just to let you know, normally for the Sorn (ศรณ์) meal course you’d need to choose one of the desserts, but since the owners are good friends of mine, they let us taste them all. 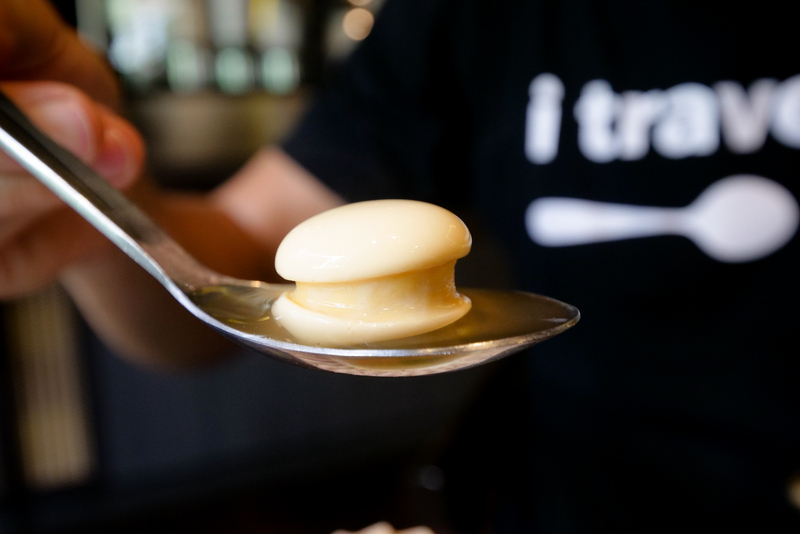 First, soy milk ice cream, served with fried Thai Chinese doughnut, and drizzled in a syrup from a palm tree that grows in the brackish waters of southern Thailand. It was awesome, the soy milk ice cream was icy and fluffy, and the syrup was fragrant like molasses. My wife Ying could barely grasp how good this dessert was. 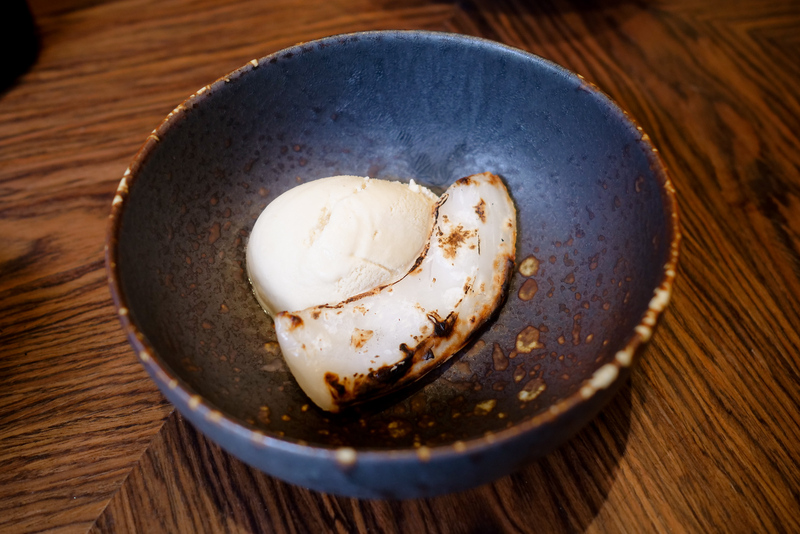 It included a scoop of ice cream made with coconut sugar, but the highlight was a slice of mutant coconut flesh. The mutant coconut flesh was roasted, and had an outstanding creamy texture and fragrant taste. 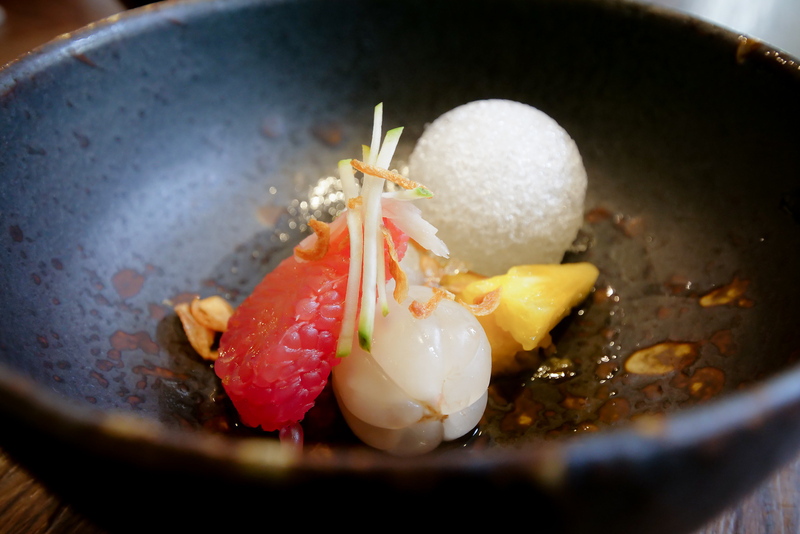 This was my choice for best dessert, a mixture of exquisite fruit, crunchy ice, and a variety of herbs for flavor. The real contrast though, were the sprinkle of toasted shallots on top, with slices of thin ginger. The end of this exquisite fine dining Southern Thai meal! Finally to finish our exquisite meal at Sorn (ศรณ์), we had a cup of Southern Thai style tea – strong tea with condensed milk. 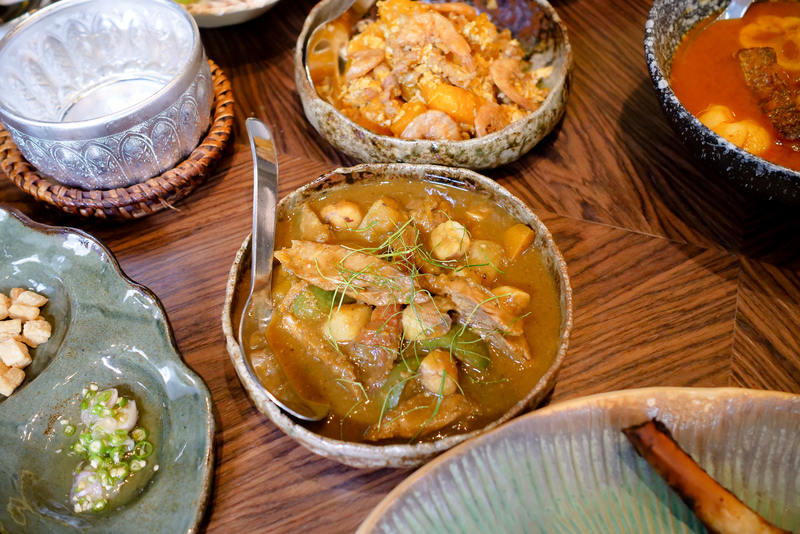 Eating at Sorn (ศรณ์) is an incredible gourmet meal experience and education on Southern Thai food. 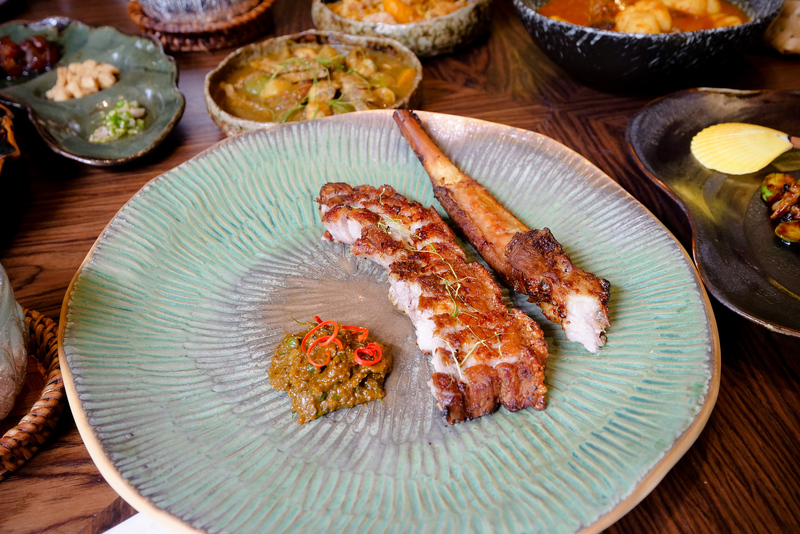 While it remained true to Southern Thai food, certain dishes were progressed into a modern fine-dining style. 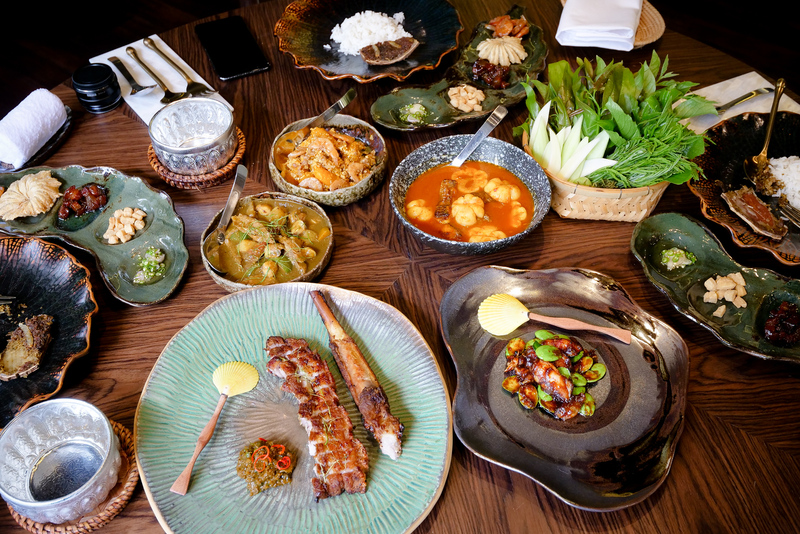 Ingredients used are exquisite, usually from the source in Southern Thailand, of the highest grade, and brought directly to the restaurant in Bangkok. 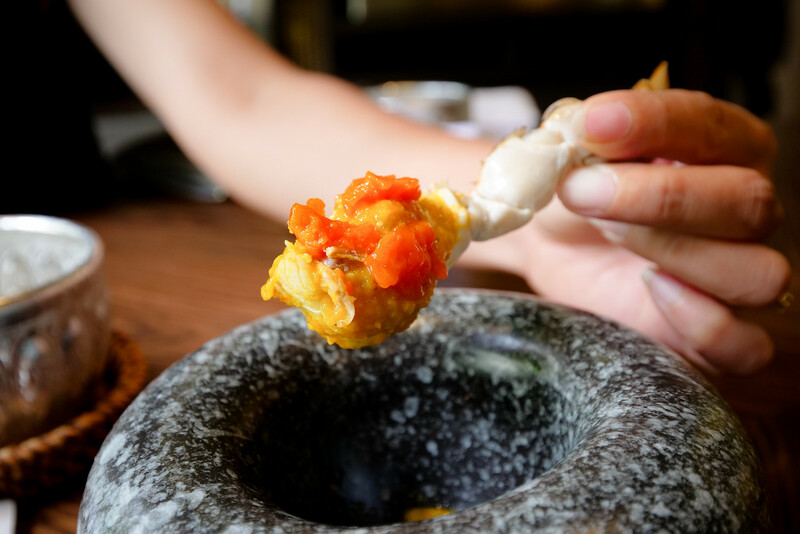 For a special treat, and one of the best fine dining restaurants in Bangkok – the only fine dining Southern Thai food restaurant in Bangkok that I know of – Sorn (ศรณ์) is a thrilling journey for the taste buds. NOTE: I did not pay for my meal at Sorn (ศรณ์). Thank you Khun Yod, Khun Ice, and Khun Pup for the amazing meal! 13 comments. I'd love to hear from you! I would like to make a reservation for 2 pax on the 20 Jan 2019. Sorn is fully booked until Feb of 2019 :'( – I will be in Bangkok from December 1st – December 9th for my honeymoon. Do you have a place upscale like this that you would recommend as well? I was really hoping to eat here as our special “splurge” meal but it seems that isn’t possible anymore! Thank you for posting all the food journeys! I enjoyed watching all the Northern and Southern Thai dishes. I will be traveling from the US to Bangkok, Hua Hin and Pattaya November 13-29 meeting my biological mother for the first time. I love all the Isan Thai dishes and love boat noodles! Any suggestions I would appreciate during my trips with my 8year olds. Thank you in advance for your recommendation. Wow, 22 courses. And my wife would eat every single one of them . (she’s Thai) They all look seriously tasty but I think this venue is probably quite expensive. Does Sorn take reservations? I believe their webpage is down. How many dishes comprises in your set meal? Are those in the photos herein? Hi we all wonder when is Ying Birthday??? Can one sit outside at this place? Looks good, might try it if so. But is it very expensive?,would you mind told me the prices ,thank you mark,because L really want to taste it. That is food on another level, wow what a great set. The photos are already insane, I cant imagine how beautiful that setting must have been. 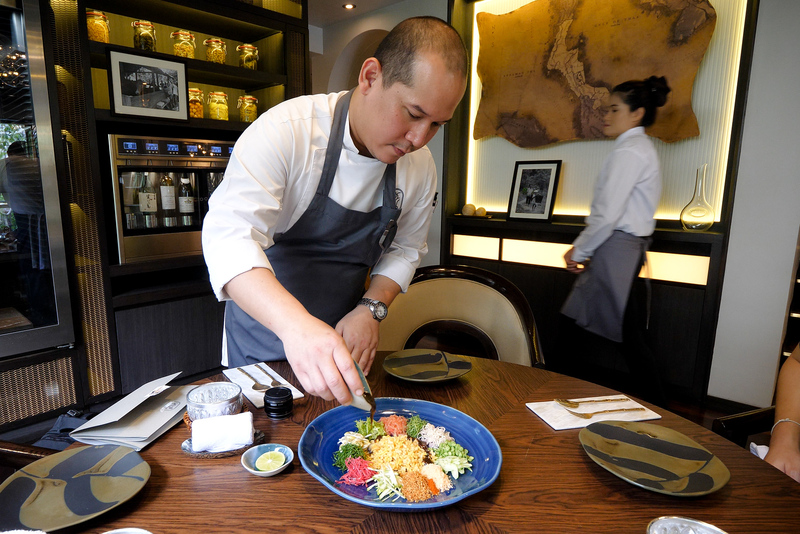 Very cool article, I want to meet Chef Yod! !